The Prosthetics Industry Gets A Human Touch The prosthetics industry is rapidly growing, allowing patients to better customize their devices, control them using their nervous system, and even regain a sense of touch. The Johns Hopkins Applied Physics Lab created an electronic prosthetic hand and arm that has the same dexterity as a human arm. Electronic prosthetics are the biggest area of growth in this industry. "When I started prosthetic wooden legs were still made almost 60 percent of the time," he says. "Back in the '70s, holding on a prosthesis by the belt, around the waist was pretty common." Forty years later, prostheses are body-powered, bionic and look and feel like real human limbs. The technology is getting so advanced that researchers have discovered how to convey a sense of touch. With so many options available — and assuming insurance will pay for it — patients are able to customize their prosthetic so that they can return to the lifestyle they had before, Vukov says. Prosthetics come in two main categories: upper extremity, or limb, and lower extremity. Within those two categories are several types of prosthetics, including cosmetic, body-powered and electronic. Cosmetic are simply for show, while body-powered devices require movement from the rest of the body in order to function. But the biggest growth has been in electronics. "These arms are battery powered, so no body strength or body movement is required to operate them, and they have a very strong grip force," Vukov says. 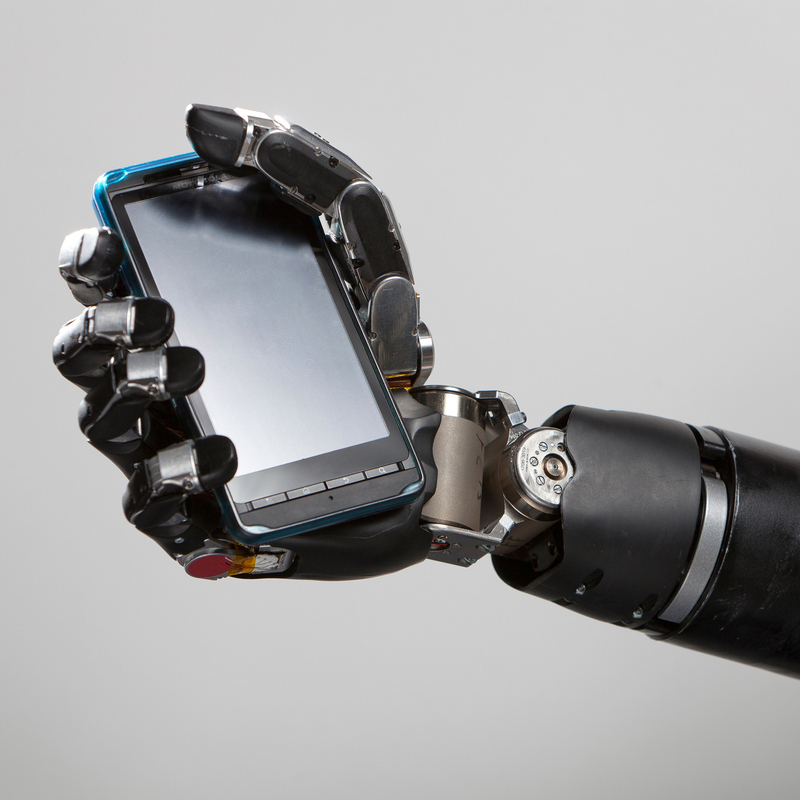 Electronic prosthetics are also safer because they make adjustments to prevent accidents. "Today you have knee joints controlled by microprocessors that control the patients walking and can make adjustments," Vukov says. "If the patient is going to fall, the microprocessor can detect that this is going to happen and can create a motion in the knee that can increase stability for the patient." Patients must be a candidate for an electronic prosthetic, and even if they are, there are many barriers to getting one. Mainly, it's difficult to get insurance coverage. "The insurance companies haven't kept up with the reimbursement of the high tech devices, Vukov says. Michael McLoughlin, the engineer leading advanced prosthetics research at the Johns Hopkins Applied Physics Lab, says that if the robotic technology in the prosthetics is used for other needs, insurance companies will be more inclined to cover them. "Right now these arms are pretty expensive because they're still a very low-volume thing, because there's not that many amputees out there," he says. "But if you start using robots to help people out who are disabled, or who work in dangerous situations, and it's all the same technology, the volumes go up and that drives the price down." In that sense, specialized robotics are like smartphones, McLoughlin says: becoming multipurpose makes devices cheaper. McLoughlin and his team built the Modular Prosthetic Limb (MPL), an electronic arm and hand with 26 joints controlled by 17 separate motors. McLoughlin says it has similar dexterity and strength to the human arm. It can grasp up to 70 pounds and pinch grip up to 25 pounds. Traditional prosthetic arms don't work as well as prosthetic legs do, he says. Their goal was to give them the same level of functionality. Johns Hopkins' MPL prosthetic arm and hand can grip up to 70 pounds. "We regularly see people using prosthetic legs to compete in sporting events, like running, biking or playing basketball," he says. "You don't see that with people that have upper extremity amputations. You don't see that level of functionality." The MPL works by asking the person to think about moving their wrist. Those thoughts are recorded, McLoughlin says, and in about two minutes — the time it takes for the signal to be recorded and processed — they're moving their wrist. "Rather than learning how to use the arm, the arm understands what they want to do," he says. 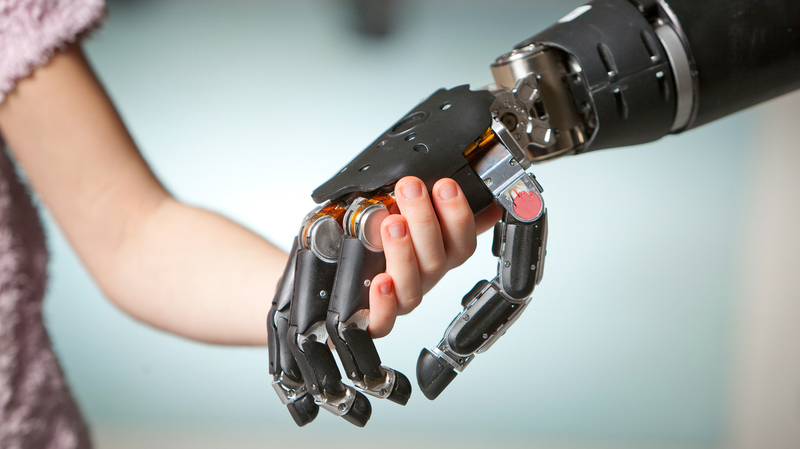 Scientists even have developed the technology to help people with prosthetics regain a sense of touch. By connecting with the peripheral nervous system or the nerve bundles on the arm, researchers at the Cleveland Veterans Affairs Medical Center and Case Western University were able to produce a sense of touch on 20 spots of a prosthetic hand. "The technology that we've developed is not the hand as much as it is the interface to the nervous system," says Dustin Tyler, the Case Western professor behind the project. "So what we do is place devices on the nerves that are in the residual arm, and we can take touch information from the hand that we turn into a neural code that the person feels like they have touched something." The next step is to put the sensors directly "into the hand in locations that are useful, such as the tips of the fingers," he says. The few who have been fitted with the interface so far say sensation lasts after 18 months, which Tyler says is a big feat considering that earlier such technology saw sensation degrade after about two weeks. The system is in clinical trials now, and Tyler says it could be years before it hits the market. McLoughlin says specialized robotic technology could be useful outside of prosthetics. "There's a lot of really exciting things that we can do with this technology and it all revolves around really developing robotic capabilities that really can do some of the things we as humans are able to do," he says. "Then we use it as a way of extending our own capabilities." Samantha Raphelson is a digital news intern at NPR.org. You can reach out to her on Twitter.